I started watching the London Marathon on TV, many years ago. There is something admirable about athletes, celebrities and everyday people running together for 26 miles, for their own individual reasons. Watching all those people on the start line, waiting for that signal, is for me a very impressive and emotional sight. Friends and family laughed when I said I was going to “do” the marathon one day. One work colleague had run a number of marathons and tried to talk me into running the Great North Run with him (or at least walking it) about 15 years ago. He made it sound quite easy. Just over 3 years ago, we were asked to “do” the marathon. 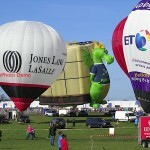 Now before you get any ideas about running, this was tethering a balloon not running. Now what I didn’t mention was that one of the other attractions for watching the start of the race was to see the balloons tethering at the start – then as the race progressed, spotting the odd one lurking in a supermarket car park or somewhere else along the route. Mr Dunkley asked me if I would write a piece for his webthingy to give you an idea about what is involved. Now just in case you expected lots of glamour and mingling with celebs on the start line, you can forget that one right away! The main race starts at 09.45hrs, but of course there are the elite and wheelchair races to set off before that. Shooters Hill, where the red start is located closes at 7am, but other roads around the site close earlier. So the first point to remember is that the briefing is at 05.30hrs. This year it was particularly chilly, as well. Briefing is a jolly event. As you would expect, we are told what the weather is expected to do (what everybody else thinks it is going to do), where you are laying out and anything else that you need to know. There is then lots of opportunity to find out what everybody has been doing over the autumn and winter, as not a lot else will happen until about 08.00hrs. If you are organised, you will have brought a cup of coffee with you – however, there is one lonely trader in the holding area (who does a lot of trade!). 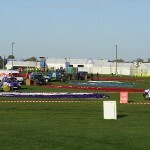 There are a couple of hospitality tents for the elite and celebrity runners in this area, lots of BBC trucks and lots of portaloos. In previous years in this area, I have spotted various celebs, fairies and other characters, although this year the only recognisable person of note was Bagpuss! Having found your place to your spot and positioned your vehicles, you just wait. Your position will depend on whether you are an event sponsor and then the rest just fit in around. Wherever you are, there are always photographers capturing the moment and spectators who have questions. 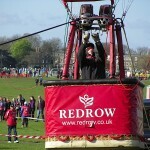 Eventually you get the sign (well a fan starting up) which is your indication that you can inflate. Once up, then it is a case of tether for as long as possible (gas and weather permitting). In previous years, we have had little wind but rain; no wind and a very warm sunny day; this year, it was dry, but with a variation from a gentle breeze to gusts of wind. I suppose we had to have a gusty one sometime! Given the number of people on the site, the phone signal gets a bit poor as it gets closer to the start time. However, texts seem to get through and it is great to received texts to confirm that we are all getting coverage. 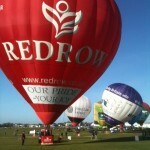 We had Redrow and our nice red balloon on the end (in our own area) stood out very well. BT, Holiday Inn and Lucozade got good coverage as the runners were on the starting line-up and Virgin Money, Jones Lang LaSalle and Palletways Dragon (Slick) had some great coverage as the runners headed along Shooters Hill. 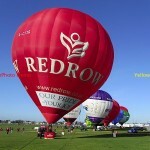 Overhead was the BBC helicopter and Goodyear Airship, which picked out the balloons on the ground very well. While we were tethering at the start, Team Blue Square were located at Canary Wharf (around the 16 mile point). They had had breakfast before tethering. They would not need to inflate for a while yet, but would be there for most of the afternoon. 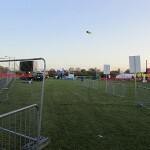 I think the last balloon to deflate was Slick, at around 10.15, by which time various gas barbeques had appeared and bacon, sausage and egg baps were being handed out. Most of the runners are through the start gate by this time. It is amazing how quickly they clear. 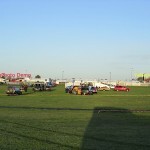 By the time all the balloons were packed into trailers, it was nearly midday. The barriers are being taken down, loos being taken away and the Council contractors are clearing rubbish and reinstalling traffic lights on pedestrian crossings. Some of the roads remain closed until about 14.00hrs, so negotiating the one way system can be fun. Is it hard work – absolutely! Is it fun – you bet! Are we going again next year – yes please! That’ll be the first gust hitting the BT balloon.